First things first, we love the design. It has a beautiful wood cabinet that is curved on either end that comes in two different color schemes to choose from —Almond Creme Anigre and Espresso Wenge. As you can tell, we are looking at the former. Wood surrounds the back, while the front is covered by a white fabric. The entire thing is quite heavy, which isn't an issue with a non-portable speaker. The level of quality doesn't stop with the speaker itself but extends to the included remote. It is a hefty metal controller and far nicer than any other bundled remote we've handled. Yes, we're talking about you, Siri Remote. Even though this speaker was released a few years back, there is no shortage of input options on the V5US. 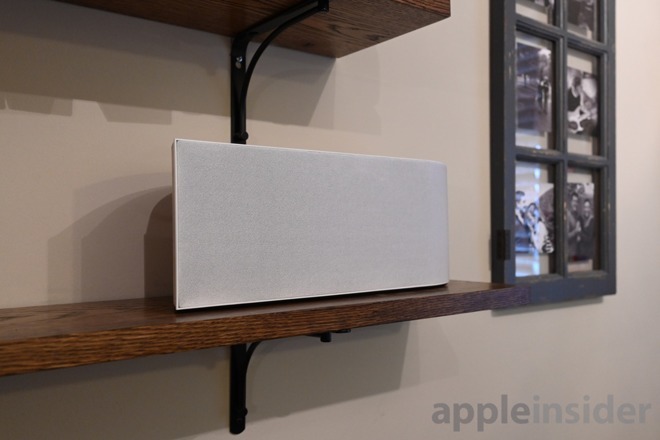 Bluetooth, AirPlay, and Play-Fi all make appearances. Bluetooth supports AptX —but not AptX HD. Regardless, iOS users can't take advantage of AptX, and should use the higher bitrate provided by the Wi-Fi AirPlay instead. 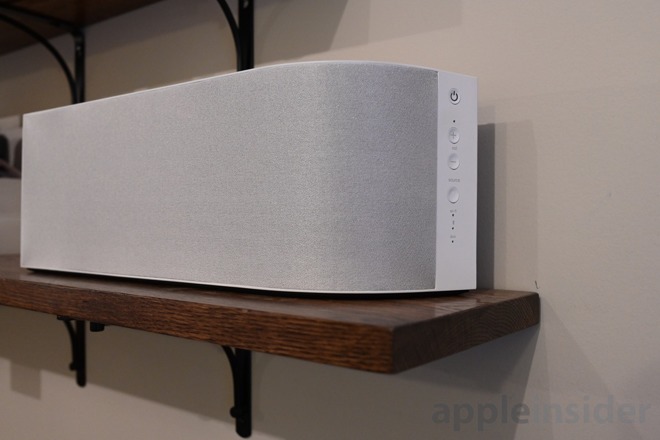 Unfortunately, the Wren V5US is limited to AirPlay and won't be updated for AirPlay 2. 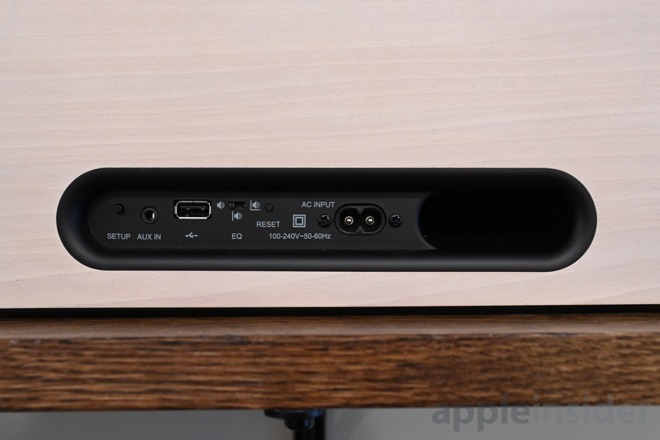 AirPlay 2 has higher hardware requirements —notably memory —that allow for the increased throughput and increased buffer. Without that additional onboard memory, Wren is unable to update the speaker to support it as we've seen with so many others. On the back of the unit are the ports, which consist of the power input and a 3.5mm aux port as well to connect to any older gear. Along the right side of the speaker is a vertical lineup of buttons to help control playback. Power, volume, and source buttons are stacked on top of one other with identifying LEDs on the bottom to denote the mode. The included remote also has the same buttons, but tacks on play/pause and mute functions. We were quite impressed with the bass response of the V5US. Thanks to a bass port positioned around back, bass had substantial depth, especially when placed against the wall. Bass is certainly punchy, but it doesn't feel out of control or sloppy. We've always relied quite a bit on guitar-heavy tracks in our testing playlist, and that music seemed well suited here. Guitars and other midrange instruments were clear and full if a bit on the warm side. Going between Bluetooth and AirPlay there was a big difference in audio quality. As we cranked up "Bohemian Rhapsody," AirPlay helped deliver that lossless audio quality and was much more seamless to use than the Play-Fi app. To better tune your speaker, the back has an adjustable EQ toggle. Based on where you've placed your speaker, you can choose between freestanding, against a wall, or in a corner. In the end, the Wren V5US certainly sounds great, but it isn't cheap. At $399, it costs more than a HomePod but lacks AirPlay 2, Apple Music integration, and Siri that you get with the latter. 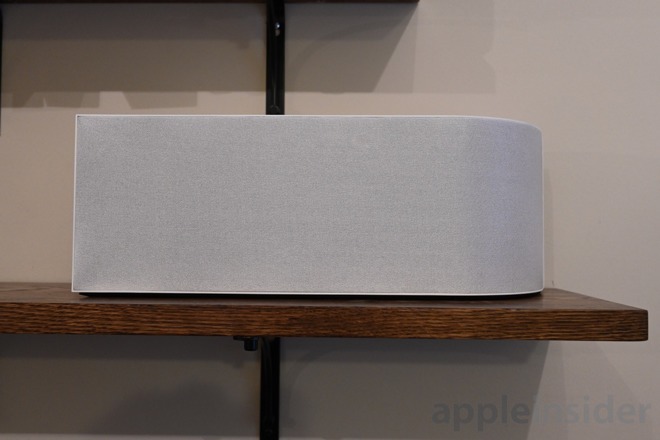 The bass-heavy balance of the HomePod at that price range may be a positive or a negative depending on what you prefer, especially if you're relying primarily on AirPlay within the Apple ecosystem. If you want a versatile speaker with multiple input options that still sounds good, while looking striking, then the V5US came to play. But, Apple users are better served by other choices. You can find the Wren V5US on Amazon for $399 in Almond Creme Anigre or Espresso Wenge —also known as white or black.